The #1 global leader in digital signage. The largest wireless jackpot innovator. Your partner in transforming the lottery retail experience. Beautifully display animated Instant Ticket selections. Highlight featured and seasonal tickets. Automatically advertise high jackpot values with full screen takeovers. Two or more side-by-side displays, ideal for placement above and behind the retail counter. Next level advertising. Hyperlocal targeting to any screen, anywhere. Touch interactive content. Engaging educational experiences. Simplify lottery purchases. Decrease congestion at checkout. Inspire younger players. Tablet with or without furniture. Successfully engage new, lapsed, and light players with custom in-lane signage. Developed with grocery, drug, and big box retail locations in mind. Ensure jackpot awareness in busy environments. Maximize spontaneous lottery purchases. Content optimized for a single screen. Ideal for smaller spaces at retail. Cost effective solution for highlighting popular Instant Ticket selections and creating real time jackpot awareness. Perfect for hyperlocal targeting and dynamic content. Simplify sports betting with Interactive Touch Tablets. How-to-play, stats, wagering, and purchases are integrated into one seamless interactive experience. Built tough for retail. Tablet available in various sizes, with or without retail furniture. The original, time tested jackpot signage. Fully-lit frameless LED display with maximized graphic area. Proven wireless communication. Ultra lightweight aluminum construction allows for easy installation and maintenance. "Billions" digit options available. Super bright and weather resistant. Built to withstand outdoor environmental conditions. Developed for strategic high footfall traffic areas, such as busy streets and indoor/outdoor malls. Replaces static signage with targeted short dwell time content. Drive players in-store with gas pump toppers. Mount weatherproof jackpot signs to exterior walls, poles at the fuel pump island, or embed in exterior monolith signs. More visible than interior window signs. Carmanah’s proven wireless communication. The digital evolution of jackpot signage. 5X brighter than a typical indoor digital sign, with HD video visible in full daylight. 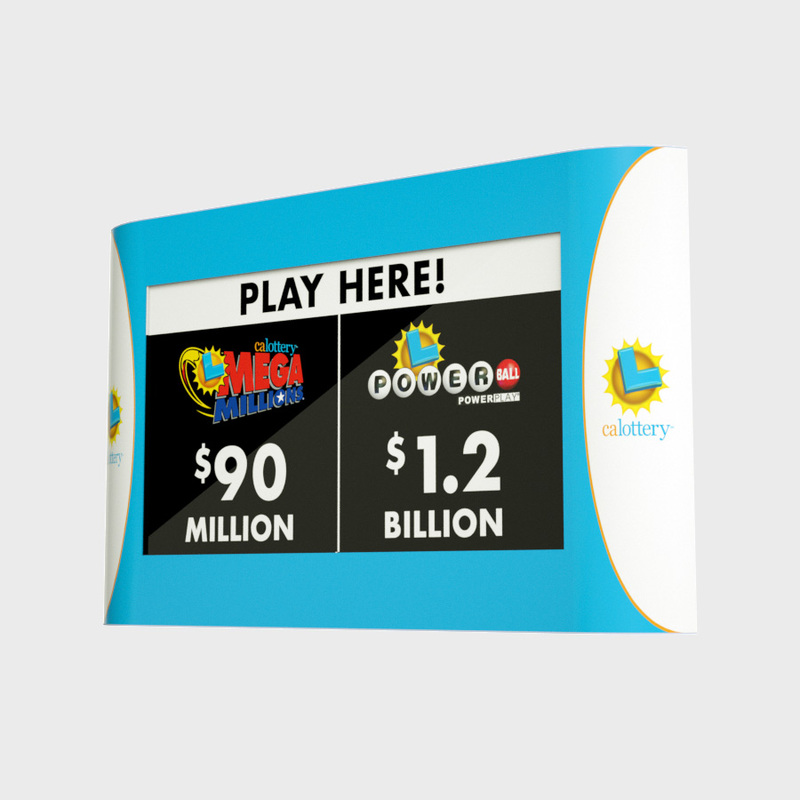 Show traditional jackpot messaging, plus virtually any short dwell time content, optimized for the window space at retail.